It’s Anne with an E who’d rather be called Cordelia, if she could. Yes, Anne Shirley and the longest running signature PEI musical Anne of Green Gables: The Musical is back for the summer with a brand-new cast, brand new choreography, spruced-up sets, and brand new visual effects. Even the music has been spiced up and sounded brighter, livelier, with jazzy innuendos best revealed in the new teacher Ms. Stacey’s (Josée Boudreau) inspiring rendition of “Open the Window”. Certainly, the addition of technology—from can-phones to the newfangled wall-mounted telephone brightened up the gossip song “Did You Hear?” The use of a few more hand props enhanced the dance numbers as well. What is not to like about the musical? This year’s musical arrangement directed by Bob Foster has the play sounding and feeling more Broadway-ish, matched by accomplished choreography by Robin Calvert. Even the ensemble seemed more exuberant and the cast displayed high levels of energy that poured out in everything they did on stage, from twirling umbrellas to cartwheels, hurdles, skipping rope, and step-dancing. The ensemble playing students were nimble, highly skilled, and just bubbling with smiles, projecting their energy throughout the Homburg Theatre. Maybe it’s also because I was sitting so much closer to the stage than usual, but there’s no denying all that energy spilling off the stage and into the audience, not to mention pacing at a clip that made the scenes fly by and seem over too soon. I remember a few years ago, I happily reported the updates made to the production with the addition of video backdrops and improvement of sets. I’m happy to report another update to the sets—my favourite being the intricate scroll-work design on the second floor of Green Gables and the opening scrim with a projected book and Marlane O’Brien’s grand entrance as Mrs. Lynde. (I’m not saying what she does with the book, but it’s really cool and you have to see it for yourself!) I’d become used to seeing Marlane as Marilla, seeing her play Mrs. Lynde is completely refreshing. Hank Stinson seemed just perfect for the role of a more playful, boyish but fragile Matthew Cuthbert. I must say I really liked Katie Kerr as Diana Barry, much more than I like her as Sophie in Mamma Mia! Her voice and tipsy giggly girlishness seem made just for the character of Diana Barry. This year’s gems are first-timer homegrown talents Aaron Hastelow as Gilbert Blythe and Jessica Gallant as Anne Shirley. Hands down, she is the best Anne I have seen, since I saw it for the very first time in 2007. Kudos to director Wade Lynch for imbuing a new vitality into this 52-year-old musical and topping an already gargantuan reputation; artistic director Adam Brazier for breathing new life into the Centre and leading it in new, exciting directions; and the entire cast and crew for this exceptional production. You all know I don’t normally rave about a performance, but I am raving over this one. Besides the performance itself, I must mention the inclusion of a song-and-cast list, something I have mentioned several times in the past and something I have wanted to see in the program. I hope it’s a practice the Centre will continue because I’m sure I’m not the only one who wants to know the song titles and who perform them. It adds to the memorability of the music. There was just one little thing I was disappointed with. Lines of sight were not checked when the school concert scene was blocked. Because I had the misfortune of being in a seat in the far right section of the audience, the whole “Fathers of the Confederation” tableau was cut from view. I know for certain I’m not the only one who had to invoke an imagination akin to Anne’s to picture that tableau and I do hope they move that scene closer to centre right so every member of the audience can appreciate the full scene. With that exception, everything about the show, from the deliciously topped cupcakes with Anne’s picture on lollipop sticks to set the audience in a good mood before the show to the sober but tender reprises of “The Words” (Marilla) and “Wond’rin’” (Anne and Gilbert), has set the perfect tone for the long Canada Day weekend as well as the rest of the summer! When Evangeline premiered in 2013, a new world-class musical was born and PEI stage was THE place to be. 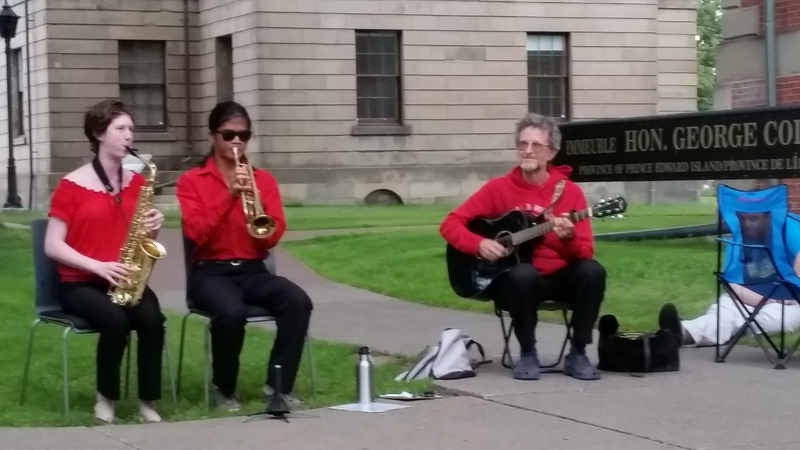 It’s 2015 and the Charlottetown Festival has brought back Evangeline with a few changes, and I must admit that I quite liked what I saw. Except for two major actors whose roles have been reprised and a couple of members of the ensemble, this year’s cast of Evangeline is totally new. Whereas, Josée Boudreau played understudy in 2013, she carried the role of Evangeline Bellefontaine marvelously with her powerful soprano and forceful character. Jay Davis, whom I first saw in Bittergirl, played an admirable Gabriel Lajeunesse opposite Boudreau’s Evangeline. His wonderful voice, at times gritty but always very masculine and powerful, dominated the ensemble. I’m hoping it was a matter of balancing the wireless microphones, but he literally drowned out Boudreau in at least one of their duets. At times, it felt as though the songs were not really composed for him. All the Broadway-style belting is overpowering, and I would have appreciated a great deal more sensitivity, texture, control, and subtlety in the interpretation of some of the songs besides full-volume delivery. Réjean Cournoyer as the invented character, Captain Hampson played the perfect villain as he did the first time around, just as Laurie Murdoch as Colonel Winslow revealed the conscience behind the whole idea of the Expulsion of Acadiens, reprising the role that humanized a reprehensible historical event. The backdrops made use of video technology, as they did in the premier showing, but rather than using the bright paintings of Claude Picard, a generally darker atmosphere pervaded the new sets designed by Cory Sincennes. I loved most the water scenes, with the actual waves moving in the projected backdrop, which added to the feeling of realism. The images projected on the backdrop were more carefully chosen so that they blended much better with the scenes. There was greater use of the revolving stage, which enhanced the movement across space and time, and eliminated the more realistic sets used in the premier. The basic set of rough-hewn lumber beams crisscrossed over the movable wings, was repeated in the stylized boardwalk that became decks, ladders, shelters, ships and boats. I would have liked to see that same feeling of roughness and simplicity in the crucifix used in the final scene. I’m glad water scenes were kept, because those were some of my favourites, especially with Gabriel and Evangeline rowing through the swamps, although Boudreau’s boat was not moving too smoothly, which occasionally jarred the illusion. It was a tad distracting, as well, to see movement under the sets when characters who were not part of the scene remained partly hidden, something that can so easily be solved by perfect stillness to maintain the illusion that they are not even there. Another tiny technical issue: the notice of Expulsion was tacked to a beam, but thumbtacks were not invented until 1903. I would have expected the soldier who posted the notice to use a nail and hammer. I would also think that he would have done this less surreptitiously as it symbolized the beginning of the tragedy that was the Expulsion. I did not care very much for more than one ensemble dance number to end with the same parallel arms raised uniformly stiff above their heads; I felt that was somewhat awkward and neither very aesthetically nor symbolically significant. I seem to remember a little more dancing in the premier as well. There were moments in the gala performance when I felt that the cast had not completely gelled together, and that some of the actors were still feeling their roles and not quite their characters. As well, I missed the completely smooth transition from one scene to another throughout that I have come to expect from the Centre’s performances. That said, I would watch Evangeline again and again and again, because, as a theatre person, I know that no two performances will be exactly the same, and the gala performance was but one show. It is still, and always will be, a powerful story with beautiful music and lyrics. This new version of Evangeline has so much going for it and I am sure that, when everything falls into place, the brilliance of writer and composer Ted Dykstra and the vision of director Bob Baker will shine through. The premier performance of Evangeline was also reviewed by this writer. Read the review here. 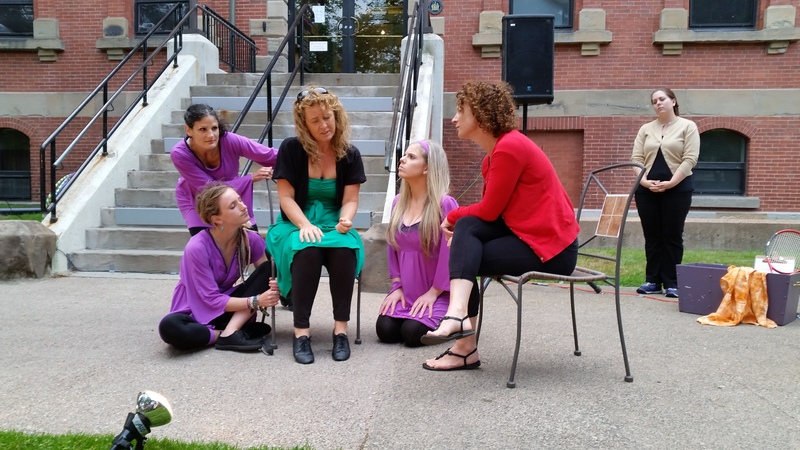 I caught a performance of Blindness: A Dark Comedy, a play by Mariève MacGregor, one of several performances in this year’s Charlottetown Fringe Festival. For those who are not familiar with the Fringe Festival, it is a frenzied weekend of one-act plays and one-person shows that have audiences running all over the downtown area with barely 20 minutes in between performances to get to the next venue. Or you can get a schedule ahead of the weekend and plan your 4 days so that you can leisurely stroll to the ones you want to see beginning at 5 p.m. and straggling home around 11 or midnight. Each show is staged at different times on each day of the festival, so it’s quite possible to catch all of them within the earlier hours of the evening. More risqué topics, however, are restricted to much later hours. All performances are free entrance with donations recommended. Back to the play I saw. Blindness is a biographical play that is based on the playwright’s actual experience of blindness from an unusual condition whereby the body produces too much blood, causing it to leak into the retina, which prevents a person from seeing. There was humour, no doubt, as the dialogue made light of a variety of situations encountered by blind people and how others can be oblivious to it or not know how to deal with it. More than just humour, though, the play was extremely enlightening in that it explained a great deal about the condition and the situation from first-hand experience. Something like Helen Keller’s autobiographical stories, but with fun. I have to admit that, while I did find the humour funny and the monologues informative, it was an awkward kind of funny–which was the general feeling I also got from the audience, who seemed unsure whether to laugh or not at times. It’s pretty much like when we make jokes about disabilities, race, and cultures. Political correctness and politeness keeps us from making jokes that might be seen as offensive especially if we aren’t the ones with the condition/race/culture. It’s okay for the Irish to make fun of the Irish, but if anyone else does it, it becomes offensive. In that vein, it might have been perfectly all right for the playwright to make light of her condition, but I thought the audience was not too sure if it was all right for them to laugh at her situation. I guess that’s where the dark comedy part comes in. Is there something you know is funny but have a hard time laughing at? Share your moments of dark comedy on The Writing Pool ! 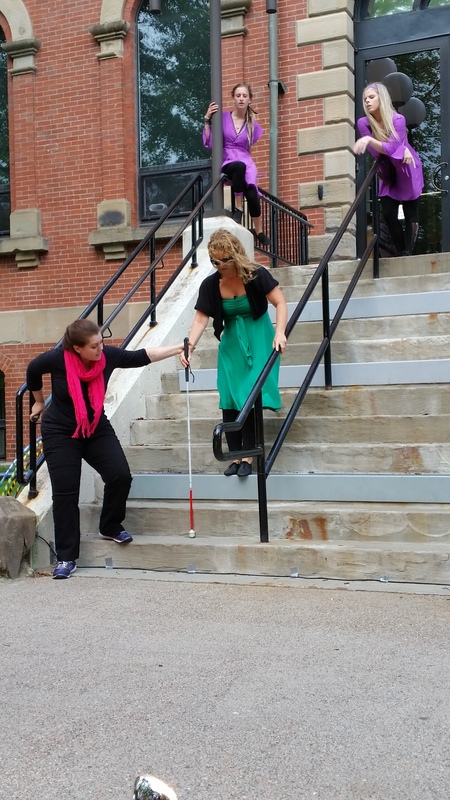 I was able to catch a performance of Blindness: A Dark Comedy, a play by Mariève MacGregor, one of several performances in this year’s Charlottetown Fringe Festival. For those who are not familiar with the Fringe Festival, it is a frenzied weekend of one-act plays and one-person shows that have audiences running all over the downtown area with barely 20 minutes in between performances to get to the next venue. Or you can get a schedule ahead of the weekend and plan your 4 days so that you can leisurely stroll to the ones you want to see beginning at 5 p.m. and straggling home around 11 or midnight. Each show is staged at different times on each day of the festival, so it’s quite possible to catch all of them within the earlier hours of the evening. More risqué topics, however, are restricted to much later hours. All performances are free entrance with donations recommended. Ba ck to the play. Blindness is a biographical piece based on the playwright’s actual experience of blindness from an unusual condition whereby the body produces too much blood, causing it to leak into the retina, which prevents a person from seeing. There was humour, no doubt, as the dialogue made light of a variety of situations encountered by blind people and how others can be oblivious to it or not know how to deal with it. More than just humour, though, the play was extremely enlightening in that it explained a great deal about the condition and the situation from first-hand experience. Something like Helen Keller’s autobiographical stories, but with fun. I have to admit that, while I did find the humour funny and the monologues informative, it was an awkward kind of funny–which was the general feeling I also got from the audience, who seemed unsure whether to laugh or not at times. It’s pretty much like when we make jokes about disabilities, race, and cultures. Political correctness and politeness keeps us from making jokes that might be seen as offensive especially if we aren’t the ones with the condition/race/culture. It’s okay for the Irish to make fun of the Irish, but if anyone else does it, it becomes offensive. In that vein, it might have been perfectly all right for the playwright to make light of her condition, but I thought the audience was not too sure if it was all right for them to laugh at her situation. I guess that’s where the dark comedy part comes in. As for the skill levels, one has to remember that the Fringe Festival is just so called because the works are by budding artists, novices, or amateurs if you will. The acting was decent, not bad for a troupe that was put together in a few short weeks. However, I could not get a feeling of passion or conviction from the troupe as a whole. I think the funniest characters were those interpreted by Andrea Filion, until she dove into a monologue. The problem with performing in an open space, is that the space drowns the characters. Even if I was sitting in the first row, I could not feel enough tension holding the ensemble together, nor was there enough projection, so that the acting was not big enough to magnetize the audience. I have to say that Ellen Carol‘s skill at hoops is impressive, considering she does it while delivering one of her monologues as the main character, Emma; I do wonder if that is something the playwright did as well, although it might have been mentioned during the monologue. Even then, the point of using hoops was completely lost on me. Was it symbolic, perhaps, of her having to jump through symbolic hoops to get through her condition? The fact that the main character had three characters playing her psyche, was, I think, not exploited enough. The psyches could be a more powerful vehicle for the comedy. I believe their presence and lines should have been more closely integrated with the main character, instead of being relegated to passively watching her in the background most of the time. There was also quite a bit of monologue, which was really explaining details of procedures or the affliction, which tended to drag. It is a prolixity that could have been avoided by involving the psyche more. Don’t get me wrong, but unless a monologue is as powerful as Hamlet’s delivered as engagingly as Kenneth Branagh would, then don’t do the monologue. Those monologues could have been improved by breaking up the information into bits of dialogue involving the psyche so that they sounded less like lectures and more like a person struggling with coping with her fears and situation. I have to say that one of the most brilliant choices was in the original music. To set everything to a jazzy beat provided by Justin Amador and Charlotte Large with those couple of folksy gospel song-like choruses by Tony Reddin at the beginning and end really set the tone for the comedy. If the pacing and acting had followed that jazz beat throughout, it would have been a great performance. In fact, I would have liked more music interspersed with the dialogue and a more active part of the performance, particularly since some bars were finished before they could even be appreciated. I’m just imagining involving the musicians in the dialogue by making them parts or voices of the psyche. I would certainly like to see this play developed more and performed to wider audiences, because of its educational value. Here’s hoping that someone will pick up the sponsorship to bring this play all over PEI and elsewhere. I have great memories of Lewis Carroll’s pair of books: Alice in Wonderland and Through the Looking Glass, which I first read as a very young child in a single-volume Children’s Classics Edition. Back then, I didn’t know what to make of the jabberwocky or brillig and no dictionary search could help me, yet the poems did make sense in my child’s mind. Watching James Reaney’s stage adaption of Through the Looking-Glass as interpreted by directors Jullian Keiley and Christine Brubaker for the Confederation Centre of the Arts’s 2015 Charlottetown Festival brought back wonderful memories of my childhood reading and the zany characters that populated the pages of Carroll’s timeless stories. Kudos to set and costume designer Bretta Gerecke for the amazing and innovative sets. I thought that it was extremely clever to show the scene changes by having the cast wheel them about with bicycles. The stylized and whimsical designs for the sets felt like something out of a cross between Dr. Seuss, Roald Dahl, and Tim Burton—straight out of a child’s imagination. Admittedly, there was a lot of cheesiness and tongue-in-cheek acting, but it enhanced the story so much so that, instead of the existing film interpretations, which feel like literal and somewhat serious interpretations of the book, the stage production created humour and evoked hysterical laughter from the audience at almost every turn. It was so entertaining with so many surprises dropping down or popping out at the audience that one could not help but be completely engaged with the performance. The use of human Zorb bubble balls was another huge surprise and I could only think of how much fun it would be. There was a great deal of complicated and complex choreography by Dayna Tekatch, interpreted by the Confederation Centre’s resident choreographer Kerry Gage and executed perfectly by the cast. Speaking of which, the casting was brilliant, and way the chorus was dressed and acted was largely responsible for chortles that broke out from different parts of the audience each time they appeared. I had always read Carroll’s two books as somewhat serious adventures where the well-mannered Victorian Alice just could not understand why everything had to be so illogical and so silly, but this interpretation has given me a totally different and fun perspective on the story. It has made me see this from a child’s point of view, which could be just what the author intended in the first place. That the looking-glass world was also funny was evident throughout and magnified by the silliness of the acting. I have to admit that I was taken aback by Natasha Greenblatt’s powerful and lower-register voice, which is the opposite of the almost shrill falsetto childishness of the Alices of film, but once you get over the it in the first scene, it grows on you and becomes a warm, conversational tone that does not jar the eardrums. The Red and White Queens, Charlotte Moore and Eliza-Jane Scott were spectacles on their own. Qasim Khan as the White Knight was a walking—or rather, rollicking, bouncing—comedy and the knight’s horses were a riot. While Hank Stinson as the Red King uttered nothing more than snores, his sleeping presence commanded enough attention to keep the audience in stitches. The White King, Rejean Cournoyer, on the other hand, stole his laughter as he executed his single-square moves in his scene. As town councilor Greg Rivard said, it was a bit slow starting but was thoroughly enjoyable and interactive by the second act, so that his kids enjoyed it very much. That children will enjoy it is undoubtable, as one little child yelled out answers to Alice’s questions, adding to the entertainment value. Unless you are an avid reader, I would not suggest reading the books, though, as the turn-of-the-century language lacks the vibrancy, humour, surprises, and pacing that the play brings. The 2 ½ hours it took from beginning to end didn’t seem like 2 ½ hours at all, except, maybe, before Alice stepped through the looking-glass. I could go on and on about each cast member’s performances and the clever costumes and props, but that would be giving too much away. Suffice it to say, there were surprises in every scene and you just have to see it for yourself. I do not know if the original performance of this play was meant to be interpreted this way, but I couldn’t care less because this version is what I want to remember from now on. “You’re never safe from surprises till you’re dead” is what Rachel Lynde always reminds Marilla. It’s perfect advice for the first-timer to a performance of Anne & Gilbert The Musical, running at The Guild until October. As I do every time, I entered The Guild with no expectations and a lot of questions in my head, all wondering how this play would connect with my experiences watching Anne of Green Gables The Musical. I have been to The Guild several times and from the moment I learned that Anne & Gilbert would be staged there, I was thinking that the small stage and narrow hall would constrict the performers and box in the performance too much. I was pleasantly surprised to see that the black box had been completely transformed. The whole orientation was shifted 90 degrees so that the performance space included the whole length of the theatre, as did the audience space, which was transformed by several risers providing every row of the audience with perfect sight lines. Already, I was pleased. Soon enough, the play began with the lively opening number of Avonlea schoolgirls in a passionate rendition of “Mr. Blythe” led by Brieonna Locche as Josie Pye. This song establishes the fact that Gilbert Blythe is the most sought after bachelor in town and Josie is out to make sure he becomes hers despite his known love for Anne. Margot Sampson’s portrayal of Rachel Lynde is livelier, wackier, and more endearing than the same character in Anne of Green Gables The Musical, albeit somewhat sedate in her first number “Gilbert Loves Anne of Green Gables.” Carroll Godsman’s Marilla Cuthbert still bustles around but her role as Anne’s adoptive mother has become stronger and more assertive. Ironically, it is through a letter to Anne at College that she reveals a depth of love for a former beau, which begins Anne’s journey to accepting her feelings of love. PEI’s most beloved character Anne Shirley, portrayed beautifully by Ellen Denny, is only slightly more restrained as a young adult, but still passionate and dramatic. Ellen Denny’s sweet, clear soprano voice reveals itself little by little and is at its best in her solos, my favourite being “Someone Handed Me the Moon.” Her best friend, Diana Barry, is played wonderfully by Brittany Banks, and shares Anne’s trepidation for married life. Unlike Anne, however, Diana is more excited, as she already has a beau and eagerly plunges ahead into marriage, while Anne continues holding Gilbert at bay, denying that she has any feelings for him. Patrick Cook is the perfect Gilbert, somewhat cocky, but utterly devoted to Anne, and certainly the best-looking guy in town. With his voice and looks, he most certainly will find not only all of Avonlea’s schoolgirls, but all of Charlottetown’s, hankering after him. In the same way she instantly befriends kindred spirits, Anne befriends the wealthy Philippa Gordon, played by Morgan Wagner, whose bubbly but ever-pragmatic personality dominates the stage so that the fiery red-head seems quite sedate by comparison. The projected backdrops were amazing, the proximity to the audience making one feel part of the scene, especially at the end of Act I. The sets were completely manageable and the execution of scene changes was disciplined and efficient. The costumes were reminiscent of the times. The music original, varied, and covering every range of emotions felt by the characters. The lighting was spot-on although I wonder if the space restricted back lighting and side lighting so that larger-than-life shadows were thrown about on the floor and backdrop, sometimes in more than one direction. Because the stage was much wider than it was deep, certain scenes had characters at opposite ends beyond peripheral vision, which limited the view for the rows nearest the stage. Having to turn your head to one side then glance quickly to the other just to see if something significant was happening there was a bit of a stretch. The best thing, however, was the absence of mikes. Hearing natural stage voices is something I really miss, because so many productions take advantage of wireless mikes, which can be a problem with a big cast and a lot of movement. Overall, though, the technical aspects of the production enhanced every minute of the performance and helped to draw the audience deeper into the atmosphere of Anne & Gilbert’s Avonlea. Indeed, the surprises were plentiful in this play and, I am happy to say, they were wonderful surprises! The thrill of courtship, the warmth of a close-knit community, and the cheer brought on by song and dance were conveyed over and over again throughout the play. Brittany Banks’s lively and masterful choreography enhanced every mood and the Young Company players and cast executed it precisely and enthusiastically. Patrick O’Bryan, a gentleman from Chicago sitting a seat away from me at the performance aptly summarizes what everyone in the audience must have been thinking by the end of the first act: “I am very impressed with the professionalism. 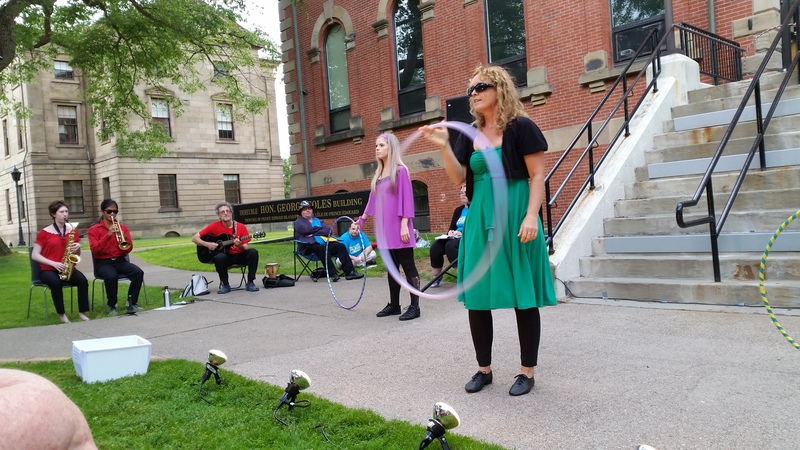 The dancing, the singing, the music—all excellent!” To add to that, I say Broadway move aside, Charlottetown is here! While it might have been a little late for Valentine’s Day, Canada in Love was not a moment too late to experience as the appeal of love songs never fades. After all, who doesn’t love a love song? Whether you’re love struck or lovelorn, bursting at the heart or broken hearted, in love with your country or just in love with love, there is a love song somewhere out there for you. And so Canada in Love made its way to The Guild theatre in Charlottetown for its final performance after a gruelling 38 performances in a 5-week tour of PEI, bringing love and laughter to the many island seniors who would otherwise not have had a chance to see the show. That was, after all, the purpose of the production team of Young at Heart Musical Theatre for Seniors. I’ll have to admit that prior knowledge had me somewhat confused. I’d read that it was a performance of several songs Canadian, so I had come to the conclusion that it was a concert of some sort. Then the programme said it was a musical by Young at Heart Musical Theatre for Seniors, so I decided it must be a musical play, in which case I was delighted. Then I saw the song list and again had my doubts as to the play-fulness of this musical. So my curiosity peaked, but I imagined it would be a completely unique and challenging script to use all the songs on the list, assuming it was a full-length play with a running time of at least 180 minutes.. Then director and choreographer Catherine O’Brien announced that it would run for just a little less than an hour. I tell you, my mind was like a 78 playing at the speed of a 45—or would it be the other way around? Anyway, I had decided that you couldn’t really have a play with all those songs in less than an hour. So I focused on the backdrop and scenery, which was a colorful screen that I initially thought was randomly designed with little hearts thrown here and there. After staring at it for a couple of minutes, trying to figure out its significance, being abstract and all, I realized it was a multi-colored map of Canada and the hearts were the provincial capitals! That was charming and quaint. And of course the wing screen on one side was a row of colourful houses along a shore, much like you would see on any eastern shore in the Maritimes. On the other wing screen was rolling plains and fields of whatever-you-will. This being the electronic age, of course the piano was an electronic keyboard with a mock-up lamp promising a bit of romance, of course, and live accompaniment. Going down the list of songs, I have to confess that I didn’t recognize several of the particularly Canadian titles and so prayed that my initiation to authentic all-Canadian music would be a happy one. At least the familiar songs spelt out c-o-u-n-t-r-y and f-o-l-k music. I’m pretty partial to country and folk music after all, and Anne Murray and Paul Anka songs on the list were a reassurance. After a 10-minute introduction and sponsorship-drumming by Catherine O’Brien, the show began. I was happy to see April Cook again, after seeing her in The Sound of Music. That she has a beautiful voice is no question, but the quality of the performance and the theatre makes a huge difference! In The Guild, April’s voice could be heard in all its power and all its nuances, the songs requiring quite a vocal range, and if there’s one thing April is good at, it’s belting out those high notes. Just perfect for a musical theatre soprano. Kevin Morris’s clear and powerful voice matched hers just wonderfully, doing vocal gymnastics from crooning to yodeling as the songs required. I’ll have to say there wasn’t a dull moment in whole 50-some minutes of their whole performance—not once in the music, dialogue, singing or dancing, which is a whole lot to say for a solid 50 minute show. Every moment was funny or lively or exhilarating or whimsical with a lot of campy humour and music playing all throughout. Sean Ferris certainly did an amazing job at the piano and he’s a wonderful accompanier—you could tell he was looking out for the actors and not just playing on ahead by himself. With him at the piano, even I would be confident singing out there with the rest. April and Kevin switched characters on and off as quickly and as clearly as changing hats—which they actually did with the authentic and famous Canadian hat dance—and when one of the hats flew down to the audience, they managed to get it back with witty ad-lib by Kevin “after 38 shows…” all without skipping a beat. I just wonder if that was actually planned or if it truly was an accident. While each performer was excellent and their duets were in perfect harmony, they were no Fred Astaire and Ginger Rogers, and after 38 shows, they couldn’t raise their batons at the same level or keep them aligned somewhere near the start. That didn’t stop me, though, from expecting them to break out into a step-dance or tap-dance number during the piano interludes. Such was the vivacity and energy they exuded. In the end, they summarized the top ten things Canadians love and I will quote: Tim Horton’s, the Canadian Rockies, Healthcare, fresh water, freedom, multiculturalism, the changing seasons, the Canadian landscape, the Canadian character and home. Their one addendum was hockey for the rousting grand finale, The Hockey Song. My one addendum to the list of things that Canadians love: music! Even if one did not know who Anton Chekhov was or had never seen nor read The Cherry Orchard, he or she would find much to appreciate in Duncan McIntosh’s The Shore Field, which McIntosh based on Chekhov’s play. What will make it endearing to PEI audiences is that McIntosh’s play is set in PEI, just outside North Rustico in 1973. The story revolves around a famous actress Alfie Rainey, who returns with her daughter to her family home in PEI one summer. Her homecoming, however, albeit rife with nostalgia, is not a very happy one, as she learns that the property is in arrears and that she needs to make a decision to either subdivide and sell or lose everything on the auction block. While waiting for her to make a decision, two potential romances crop up—one between her housekeeper Donna, played by Laurie Campbell, and their former farmhand-turned-successful businessman Larry, played by Jody Racicot; the other between her daughter Anna, played by Rebecca Parent, and her dead son’s former tutor Joey, played by Jonathan Widdifield. Alfie’s role is masterfully portrayed by Gracie Finley, a former long-running star in the Charlottetown festival musical Anne of Green Gables, who returns to the PEI stage after a long absence. Alfie shares several nostalgic memories with her brother Augustus “Gus” McNeil, played by itinerant Toronto-based actor Jonathan Whittacker, who has perfectly portrayed the typical Islander male’s amusing and endearing, if not bordering on the annoying, penchant for long-windedness. Rounding off the cast is Teresa Costello as the family’s long-time nanny who still takes caring for Alfie and Gus as her main purpose in life. Even if it is based on Chekhov’s play, The Shore Field reveals much of Islanders’ sentimentality and attachment to the Island and how difficult and painful it is to say goodbye to the past, to old possessions, old lifestyles, even people who were always in their lives. Like Chekhov’s play, The Shore Field explores deeper issues such as the breakdown of social structures, the shifting economy, and the reasons for the diaspora from rural PEI to other provinces. It shows the fall of the landed gentry and the rise of the lower class to mold a more uniform class structure that meets somewhere in between. All the old things, the things and people of the past who cannot change are left behind. Duncan McIntosh has created an extremely thought-provoking play that replicates a vital cross-section of PEI society in the 70s that could still very well be the exact same society in PEI today. Although most of the characters were not particularly dynamic and maintained pretty much the same outlook from beginning to end so that they were very much stereotypes, the strong performances of each member of the cast served the script well. Because of the nature of the thrust stage and layout of the seats in the Watermark Theatre, formerly the L.M. Montgomery Theatre, blocking and set design were quite a challenge. I feel that the audience would have benefited more if the main characters faced outward towards the audience more often than they faced inward during the first scene. That way, everyone in the audience would be able to appreciate the expressiveness of the actors rather than watch their backs. I might have reversed the staircase so that the characters could all face the audience more, or modified the blocking so that it was the minor characters that had their backs to the audience. That said, this is nonetheless a mini-masterpiece of PEI theatre that is something every islander must definitely see this summer.